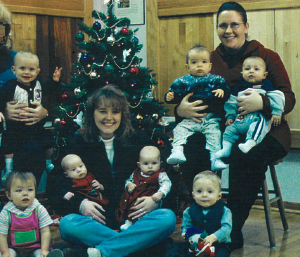 At our company Christmas party in 2000, a lot of babies and toddlers were around, and three women were pregnant. All this new life made me happy. Each child was a welcome and cherished member of the Ralph’s family. My own wonderful daughter, Kayla (born July 2000) was in the crowd, so I identified with every young family there. It felt good that Ralph’s was a part of our budding lives. We got the idea at the party that the young ones and the pregnant mothers should grace the front of our company Christmas card (shown above). So that’s what we did, taking the photo on the spot. It’s now one of my favorites among our annual Christmas cards. The young kids in this photo (and those soon to come) are now young adults or verging on it. But I have that “I knew you when you were a little itty-bitty thing” with them all. It’s nice. Seven of the 10 kids in this photo (including the soon-to-be born) have a parent who still works at Ralph’s, and several of these kids worked for us at one point or another. That’s another thing that makes me happy about this card. I’m not just paying lip service when I say, “the Ralph’s family.” I want Ralph’s to be a place where we don’t just work with each other; we care for each other. A place where we stick together. This card is a great snapshot of that. We have what, in sports, is known as team chemistry. That pays off for our customers because our team works hard together to get the win for you—a beautiful, artisan, fits-your-taste floor that is a showcase of your home. This chemistry and comradery are also important to us because, well, who wants to work with people they don’t like or respect? Not me. Merry Christmas to everyone in the picture and to everyone associated with it. Merry Christmas to anyone we’ve ever worked for or with. Merry Christmas to you! May all your hardwood dreams be good.